You’d be hard-pressed to find more important practical money skills to pass onto your kiddo than this one – how to save money. I interviewed 16 Mama Bears about what they want to teach their kid(dos) about money (such as, kids save money? Stay out of the debt cycle? Investing? Etc.). But I didn’t just want to know the steps they were taking, or what custodial financial accounts they had opened. I wanted to also understand their own money hang-ups and relationships. Psst: by the way, would you be a doll and take this survey yourself? I’m always trying to learn more about what it’s like to be YOU trying to teach your child about money. I was pretty shocked to find out that 14 out of 16 of the women who took the survey said they’d received little to ZERO money education from their own parents. The thing is? I know you’re different. You want to teach your child one of the most important life skills you can – money management – because you don’t want them to start out in the deficit (figuratively, and literally) that you did. I’m here to help you with just that. Listen UP: If I could only choose ONE lesson that I could help you teach your kid(dos) about money – and there are umpteen numbers of lessons to choose from – then I would choose how to save money, hands down. I’m not a betting woman, but if I were, I would put ALL my chips onto that one. Saving money – the automatic outcome to another important money lesson of spending less than you earn – gets people out of a lot of problems. Have an emergency fund/buffer savings to tap for those life oopsies. Have money to start investing. Put a down payment on a home. I could go on. But instead, I’ll jump into ways to get this lesson to stick. Because let’s face it: saving money does not come naturally to many people. Let’s attack the challenge of teaching your kid(dos) to save their money from all different angles. I’m going to show you 6 big steps you can take to implant a healthy savings habit into your child now – before their checking account depends on it. But that’s not all! 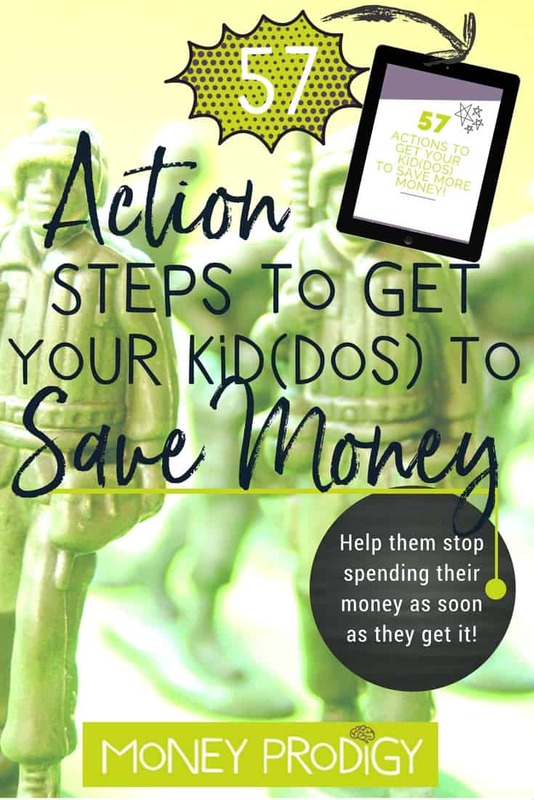 I’ve actually created a free checklist of 57 different savings action steps to get your kid(dos) to save more money. Let’s talk about the actual process of letting money accumulate. Your child needs to learn that money can accumulate when it’s left alone – both from compound interest earned in a savings account, and from saving a few dollars from allowance-to-allowance. In order to see that, you’ve got to set up saving-money spaces. Otherwise, you might just continue to find it crumpled up on their bedroom floor (*gasp*! Yes, I’ve had more than one Mama Bear tell me this is an issue in their household). Action Step: Set up a bank-trip day in your household. Let your kiddo know that on this day (weekly, bi-weekly, or monthly), you’ll be swinging by their savings account bank and they can make a deposit. And to get them really motivated? Swing by on this day, even if they have no money to deposit. It’s a nice reminder for them to save their money. Your kiddo – just like us adults – will be much more motivated to save their money if they have a very specific goal in mind. Help them come up with their goal to save for, and then tie every money conversation/money question they have back to it. Wow will those conversations be more meaningful to them! Action Step: Help your child narrow down a savings goal that will take, at most, a few weeks to reach. Otherwise, they’ll lose interest! Sure, your kiddo might have a goal to save for now…but what's going to keep them motivated to actually continue putting money aside for it in the weeks and months to come? Action Step: Introduce a savings matching bonus that takes place at the end of the second week of their savings goal attempt. Do it again, but two weeks after that. Ahhh…the anti-savings behavior that most kiddos (and adults) wrestle with. We’re not just growing money with these action steps – we’re growing lifelong habits. Let’s change this behavior by establishing a healthier one so that when your child gets their hands on their first paycheck they know what to do with it. Action Step: Change the day of the week when you give your child an allowance. You don’t want to give them money the night before they have boundless opportunities to spend it (such as a Friday). Instead, give them their allowance on a Sunday night. That way, they’ll have to save some of it for next weekend…or else live with the outcome of a penniless weekend (trust me, they won’t do that more than a few times). Isn’t it so frustrating when your kid buys something that (and you know this ahead of time – ahhh it’s almost a curse how clairvoyant we Mamas are, right?) they’ll stop playing with next week? So, how do you get your kiddo to stop wasting their money? Well, they’ve gotta understand that money has value. That not spending their money on something that has very little use for them, and instead spending it or saving it up for something that will make a bigger difference in their life is the way to go. Action Step: Take a toy-graveyard inventory with your child. Ask them to gather a hand full of toys that they no longer play with because they lost interest. Now you go in and gather a hand full of toys that they “wasted” money on because they bought them (or you bought them at their pleading) and they stopped playing with after just a few uses. Take out a pen and paper and get them to help you estimate what each toy cost at the time of its purchase. Then tally up the total. Reveal this to your child, then ask them how they would feel if, instead, they had this money in their savings right now. Now that we’ve got savings space(s) set up + optimized, let’s start looking at ways to earn and source more money to actually fill ‘em up! Action Step: Come up with a list of 7-10 different Savings Chores/Projects around the house that your child can do. What makes these special is that the money earned from them goes directly into their savings space for their goal.